OSH PROVINCE -- Kyrgyz police are nabbing more radicals with the help of vigilant citizens who prize peace and stability and want their relatives safe from the clutches of extremist recruiters, State National Security Committee (GKNB) spokesman Ulanbek Jalildinov told Caravanserai. The effort continues as an estimated 600 Kyrgyz militants have left to fight in Syria and Iraq. Authorities recently opened a criminal case against "Sh. T.", a 32-year-old woman from Osh, who is accused of leading a criminal group, after police found extremist material on her on October 29, Interior Ministry (MVD) spokesman Baktybek Asanaliyev said. Police picked up three other suspects in the same operation, Asanaliyev told Caravanserai, adding, "They all recruited and sent our citizens to fight in armed conflicts in Syria." Investigators found that Sh. T. led a female extremist cell, the MVD said, adding that the extremist material found on her was tied to the "Islamic State of Iraq and the Levant" (ISIL) and the Tawhid wal-Jihad extremist movement. Authorities on November 18 opened a criminal case against Sh. T., Asanaliyev said, adding that in 2015, she tried to go to Syria but "was detained and removed from an Osh-to-Istanbul flight". Even after that incident made her a suspicious figure, she continued to promote extremist ideas and recruited the three men arrested with her, Asanaliyev said. Those three in their turn urged youth to go to Syria, he added. All four suspects are now awaiting trial. Authorities, in unravelling the group's various ties, nabbed a fifth suspect, "B. D.", 32 of Osh, who allegedly stored and distributed videos for extremist groups like Jannat Oshiqlari, the Islamic Party of Turkestan (the former name of the Islamic Movement of Uzbekistan), and Imam al-Bukhari Jamaat, Turmush.kg reported on November 28. "A preliminary investigation revealed that he had already managed to circulate some of his print and digital materials through underground channels," Jalildinov said. At a recent Bishkek conference, "New Ways to Fight Religious Extremism: Youth Initiatives", MVD official Erlan Bakiyev warned of the threat posed by the organisation Hizb ut-Tahrir, 24.kg reported November 23. In Kyrgyzstan, almost 82% of extremist groups' supporters belong to Hizb ut-Tahrir, he said, adding that the role of Kyrgyz women in extremism is growing. He put the number of Hizb ut-Tahrir members in Kyrgyzstan at almost 2,000. In 2005, women committed 1.1% of extremist crimes in the country, he said, adding that by 2016, the figure had reached 23%. Other extremist groups, with smaller memberships, pose a threat to Kyrgyzstan, Bakiyev said at the forum, citing Jaish ul-Mahdi (Army of the Righteous Redeemer of Islam) and the "Islamic State of Iraq and the Levant" (ISIL), among others. 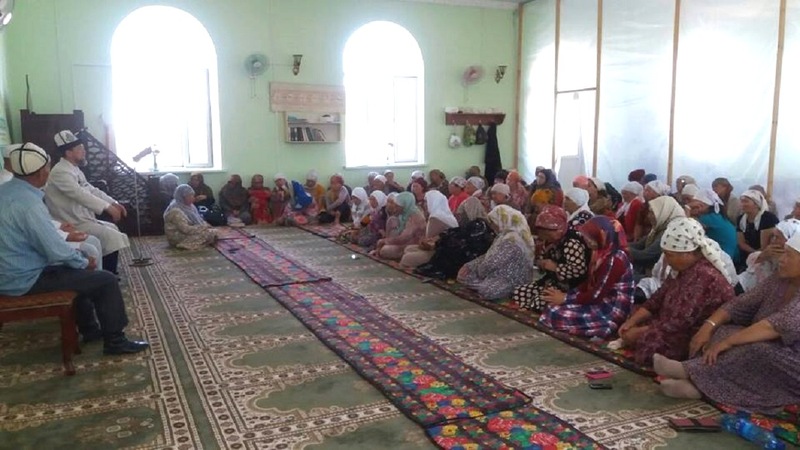 Kyrgyz like Nazokyat Abduljanova, 47, a resident of Kashgar-Kyshtak village, Kara-Suu District, Osh Province, support the effort to defuse radicalism. "I'm impressed by the local authorities' effort to fight ... ignorance among Muslims," she said, citing frequent rallies that occur in her village and nearby villages. The local authorities "organise lectures, forums and marches", she said. "They do mini-presentations in schools on [labour] migration and the extremist recruitment that can be linked to it." Kara-Suu District and Osh city are probably the Kyrgyz jurisdictions that provide the most recruits for war in the Middle East, she said, adding that they therefore have an incentive to stop the exodus of brainwashed extremists. "Many of us now understand it's someone else's war," she told Caravanserai. "People who have gone there have already become cannon fodder ... They'll never go to heaven. They killed innocent people there." Some extremist recruiters are turning out to be well educated and persuasive individuals, authorities warn.